HTML5, HTML5, HTML5 — it seems to be the only thing anyone wants to talk about these days. And that excitement could get kicked into overdrive next week when Facebook unveils Project Spartan, their platform for HTML5 apps. But why wait? A startup that launched at TechCrunch Disrupt has already built an entire HTML5-based OS: Carbyn. The great thing about Carbyn is that there’s nothing to install. Because it’s HTML5, it works in the browser. Well, any “modern” browser, as Google often likes to say — that means essentially anything but the older versions of IE. You simply open a browser and log-in to Carbyn and you’re ready to go. The team showed it to me running on both an iPad and a BlackBerry PlayBook. Soon it will work on smartphones as well, they say. 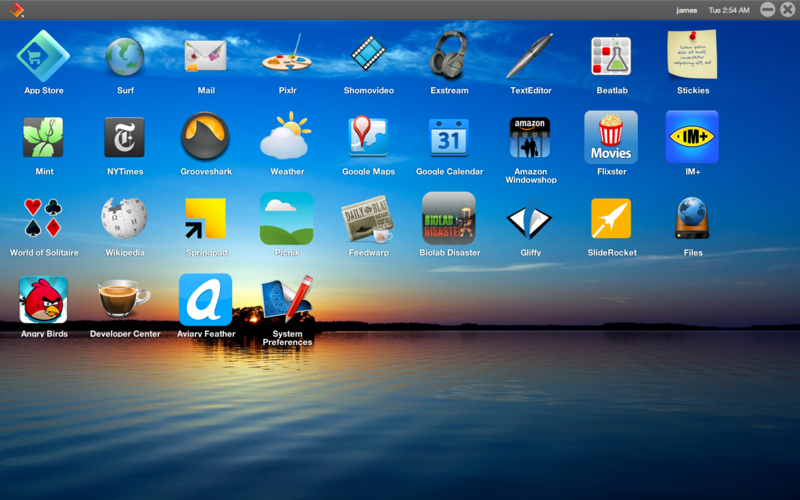 Once you load up the OS, you can pin any app to the main OS screen (again, all in the browser). Apps can be tailored for Carbyn from the ground up (still using all HTML5) or there’s a wrapper that can be used to make existing apps work. There’s a SDK for all of this, and the team says that they can get any app up and running in less than a half hour. So how is this different from something like the Chrome Web Store? Well, that’s just a store for HTML5 apps, it’s not an OS to run them. They still run in the browser itself, and that means when you close one, you’re just closing a window or a tab. When you close a Carbyn app, you’re taken back to the Carbyn homescreen. But the key is that there’s much better multi-tasking thanks to their SDK which allows different apps to talk to one another in a way that traditional web apps can’t. In many ways, Carbyn is more similar to the browser itself, Chrome. Or even closer, Chrome OS. But the Chrome Web Store only works on Chrome and only on personal computers. Carbyn is meant to run anywhere (again, anywhere with a “modern” browser). “Google wants to promote their own products, we’re agnostic,” co-founder Jaafer Haidar notes. Carbyn is probably a bit closer to Jolicloud, a startup we’ve covered a bunch. But they’re in the process of refocusing their product. And the truth is that they were always a bit different anyway. While the vision may have been similar, Jolicloud perhaps suffered from being a bit too early to the space. When they launched, HTML5 wasn’t on the tip of everyone’s tongue, so they had to build an OS around Linux. As for Facebook with Project Spartan, Carbyn anticipates it will have the same problems as the Chrome Web Store in that it will be too closely tied to the parent company. “Hopefully Facebook doesn’t try to pull a Microsoft and create some proprietary hooks for HTML5,” Haider says. Carbyn is now focused on partnering with some key developers to tailor apps for their platform. They eventually plan to take a cut of app store sales (the standard practice) or possibly do affiliate deals. The Canadian-based startup has 5 employees and has been entirely self-funded up until now. They’re in the process of raising their first outside funding. See Carbyn in action in the video below.